Each module contains single Timepix device with fast parallel readout up to 850 frames per second depending on occupancy of frames 1 . The independent USB 2.0 communication channel for each device assures fast read-out of complete modular system. All modules in the system can be operated synchronously or triggered independently. The sensor type and thickness is of customer choice. 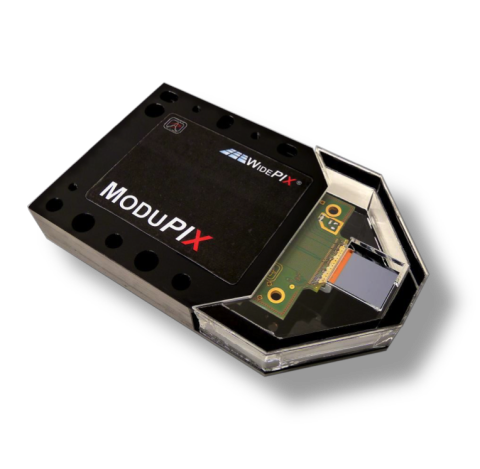 The MODUPIX can be used in variety of applications such as fast radiography (X-rays, neutrons, ions), spectroscopic imaging (each pixel records the energy spectrum), particle tracking, Time-of-flight imaging, multilayer Compton camera (thin top sensor, thick bottom sensor). The sensors can be adapted for neutron imaging by deposition of converter layers2. The spatial resolution in some applications (slow neutrons) can reach units of microns or even submicrometric level (ions).